Creating a list of contacts is a fundamental task for Marketing and Sales departments. Often marketing and sales not only want to know which accounts are engaged, but also which accounts are NOT engaged. As an example imagine it's the end of the quarter and your sales team is calling out which opportunities are going to close. You bring up CaliberMind and pull up a list of the Accounts that have current opportunities in the quarter, but have little or no engagement. It allows the sales team to focus in very quickly on accounts and understand if they are really valid for the quarter or not. Once you have this list of low engaged accounts you can then easily see what is going on. Has the account received a LOT of emails but has not responded? Have the wrong people been engaged in the dialog and therefore it's scoring much lower than it should? There are numerous questions that can be asked, and answered regarding the account once you start to look deeply at what is occurring across all the different platforms (Marketing, Sales, etc.). Building out the list in CaliberMind is very easy. 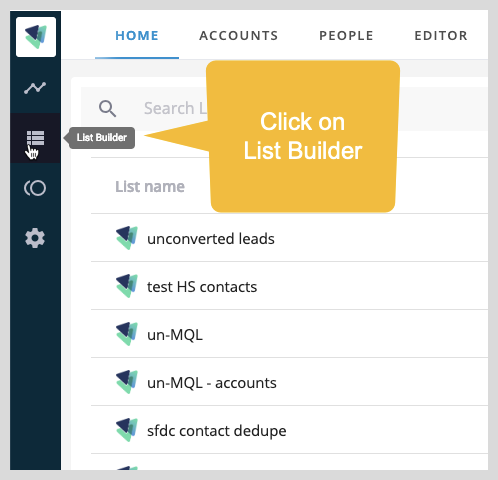 Select the Accounts Tab, in the drop-down select Create New, type in the name of your new list and press OK.
Once we are in the Account List builder we can easily add the filters to give us just the list we are interested in. In this example we are going to use the following filters. cm_engagement - cm_engagement contains the account score for all accounts within the system for all of the different scoring models deployed. We want all accounts whose score is less than 10 for this example. We also want to limit the results to a specific model, so we need to filter on the Model name. sf_opportunity - sf_opportunity is a complete record of all opportunities from your Salesforce system. We want to make sure we are only looking at open opportunities. So here we will select the stage_name values for just open Opportunities. Note these are the value in our demo environment and need to be matched to your stages. Test and Save the List by selecting Test in the upper right. Make sure you see results (it should say the number of row's returned. Don't worry if it's more than what you expect as the total is the number of Contacts at all Accounts that match the criteria. Specific reports will filter this down to just eh Account. If you are good with the list select Save. Now you can see the list as a filter on any Account based report like ABM - Engagement Trends or Attribution - Attribution Overview. Check out the complete walk-through on how to create this list here.